Sometimes even Tony Stark needs a little help. I am, however, just a little surprised that with his unlimited budget and all of the technology at his disposal, help comes in the form of a DJI Phantom. 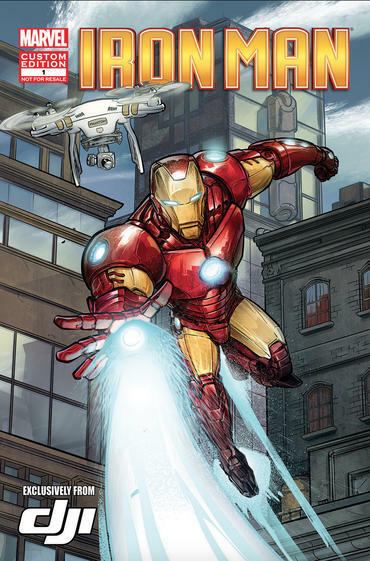 If you are curious how a DJI Phantom ends up with a supporting role in an Iron Man comic, the answer is simple. While this may not be common knowledge, Marvel comics offers Marvel Custom Solutions services, a marketing program that uses Marvel characters and custom comic books to push products for major brands. Since this is a custom marketing product, don’t expect to find it at your local comic book shop. Print versions were briefly available on the DJI Boat at Comic-con. I’m assuming these will eventually become collectors items. In the comic, we see a journalist equipped with a DJI Phantom use the quadcopter to alert Iron Man to impending danger at the fictional Roxxon Labs. M.O.D.O.K. manages to escape Iron Man through a dangerous portal, so the brainiacs at Roxxon Labs decide to send the Phantom drone through the portal to find him. The comic is called “Remote Possibilities #1,” and was created as part of the Marvel Custom Solutions service. That program is a marketing outlet that designs advertising campaigns by creating custom comic books for brands like DJI, Adobe, Lexus and many more. If you are interested in reading the comic yourself, Marvel has made it available online.